Baked pasta dishes have become very popular and are served as main courses, side dishes, or as the first course of a meal. There are many different baked dishes but one of the most popular and well known is lasagne. Lasagne is a layered dish that is made in many variations. Baked pasta consists of dishes layered with ingredients, dishes consisting of stuffed pasta, and dishes that have tossed ingredients. Most baked pasta dishes can be made a day ahead and then baked just before serving. When preparing baked dishes, most ingredients, including the pasta, must be precooked before the dish is baked. Baking is just a means of thoroughly heating all of the ingredients as one dish. Some dishes are broiled for a period of time to provide a crisp surface. 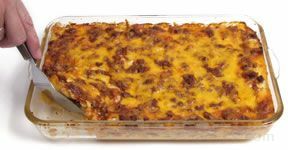 The only time precooking is not necessary is if you are using homemade lasagne sheets that have not been allowed to dry or if you are using a "no need to precook" type of commercial lasagne sheet. The baking dish used for baked pasta should be heavy duty and made of an ovenproof material, such as glass or ceramic. The dish should have fairly high sides to prevent the bubbling sauce and melting cheese from spilling over in the oven as the dish bakes. Many times the bottom and sides of the baking dish are buttered before ingredients are added. Buttering the bottom and sides helps prevent the ingredients from sticking to the dish when it is baked. Baked pasta dishes include ingredients such as pasta, meat, fish, cheese, vegetables, herbs, spices and some type of sauce. The sauce can be tomato or cream based but must include enough liquid to provide sufficient moisture to keep the pasta dish from drying out. During the baking process, the pasta will be further cooked and will absorb some of the liquid from the sauce. When precooking the pasta, it is important that it is removed from the heat while it is still a little undercooked, otherwise, the additional cooking and liquid absorption during the baking process will cause the pasta to become overdone and mushy. The precooked pasta should also be well drained so excess moisture is not added to the rest of the dish, causing it to become too watery.